I hope you have been enjoying our whirlwind trip through the blogosphere. Today we wrap up our tour by heading back to the U.S. for a stop in Mooresville, North Carolina, a little town north of Charlotte. 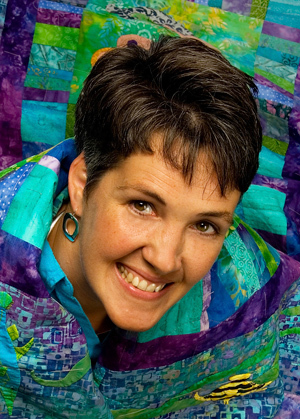 Susan Brubaker Knapp is a quilt artist, designer, and teacher who lives in Mooresville with her husband, Rob, and two daughters. 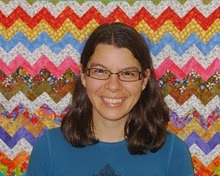 Susan teaches quilting classes at local quilt shops and online through joggles.com. Susan loves traditional hand quilting and needleturn appliqué, but has also embraced innovative machine techniques and makes “art quilts” — works of art executed in fabrics and fibers. 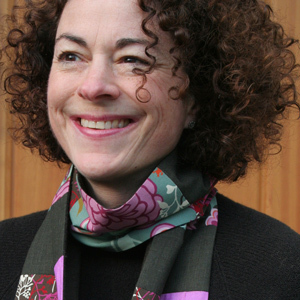 Her award-winning quilts have been exhibited at national and international venues. 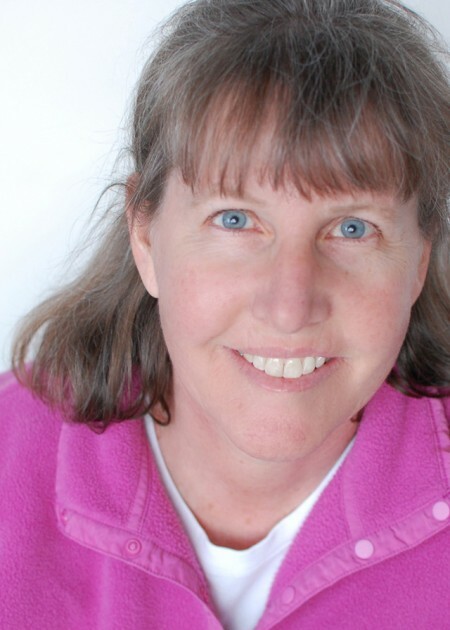 She’s the author of Appliqué Petal Party and the soon-to-be-released Point, Click, Quilt! from C&T Publishing. 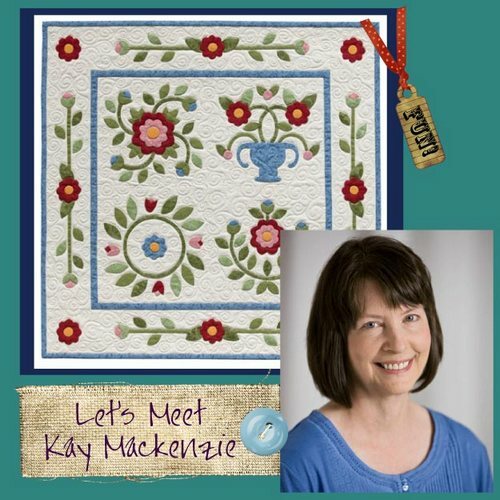 Make sure you check out her Quilting Arts Workshop DVDs about machine quilting and thread sketching too! Here we go, off to Susan’s blog Blue Moon River! It’s Day 9 of our 10-day Book-A-Round 2. And we’re not even jet-lagged! Today we head east once again to Mississauga, Ontario. Mississauga, the sixth largest city in Canada, is home to Maria Michaels Designs. Maria is a quilter, quilt designer, online quilt teacher at QuiltCampus.net, web designer, blogger, and just recently she added a very impressive credential… she’s the editor of the new on-line Quilt Pattern Magazine! So click on over to Mississauga, just across the border from Buffalo and Niagara Falls, for a visit to Maria’s Quilt Scraps, where Maria talks about the Appliqué Questions and Answers section of Inspired by Tradition. Today we cruise eastward across Canada to land in Espanola, Ontario, home of the delightful Sarah Vee. Well, I know her as Sarah Vee but in full she’s Sarah Vanderburgh, enthusiastic quilter and blogger. “Sew something happy!” is her motto. As you can see, Sarah loves color and I think that’s what she’s going to talk about today. Let’s go visit Sarah’s Sew Joy Creations blog! It’s Day 7 of the Inspired by Tradition Book-A-Round. Are you having a good time visiting our stops on the tour? Today we cross the border into Canada to visit Calgary, Alberta… no passport required! You might know Calgary from the 1988 Winter Olympics, or their famous Greatest Outdoor Event on Earth, aka the Calgary Exhibition and Stampede. Kim Jamieson-Hirst, a mother of two, designs quilt patterns and is just about to have a project in Quilter’s Connection Magazine! Here’s Kim with Hootie, one of her adorable stuffies. 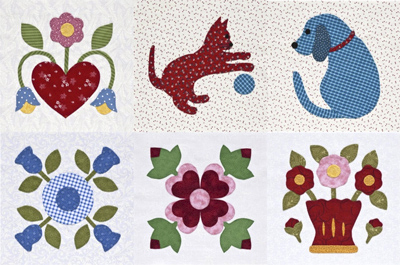 Kim’s website is Chatterbox Quilts, where you can see all of her patterns. Today Kim is writing about the very cool CD that comes with Inspired by Tradition and what a wonderful convenience it is for the appliqué enthusiast. Let’s go visit Kim at her blog Chatterbox Quilts Chitchat. It’s Day 6 of the Inspired by Tradition Book-A-Round. Today we zoom northward to visit Kathy Mack on Bainbridge Island, Washington, in the middle of Puget Sound. Kathy Mack’s Pink Chalk Fabrics has a gorgeous array of contemporary fabrics for quilting and creative sewing, plus unique patterns for purses, accessories, toys, and more. 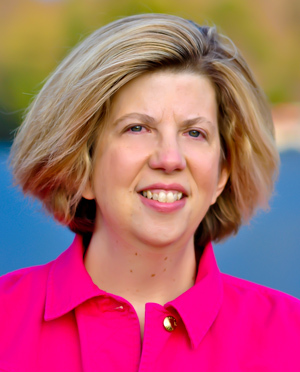 Kathy writes a beautiful, inspirational, and informative blog at Pink Chalk Studio. Click on over to see what Kathy has done with a block from the book! Welcome to Day 5 of the Inspired by Tradition Book-A-Round. This 10-day tour takes hardly any energy at all! Ready for a hop up the coast to Hollister, California? Let’s drop in on Holly Mabutas of Eat Cake Graphics, one of the most naturally talented artists I know. She designs rubber stamps and appliqué patterns that just make you smile. 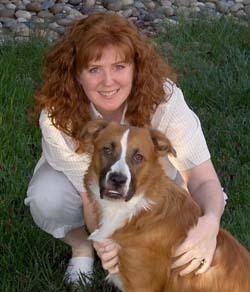 Holly, the little red-haired girl, with Puppy Tucker. Tucker recently got a new friend, little Squeaky. I hear Holly plans to show something from the book that she’s appliquéd. Show & Tell, yay! Off to Holly’s blog, Sprinkles of Thought. Is this hassle-free travel not fun? Today we get to fly through the ethernet to So Cal to visit SewCalGal. SewCalGal is all about spreading awareness. She says, “I love to find new products, books and notions that would be of interest to quilting, sewing and/or embroidery enthusiasts.” Does she ever! There’s a wealth of information on her blog. Have a great time poking around while you’re there. 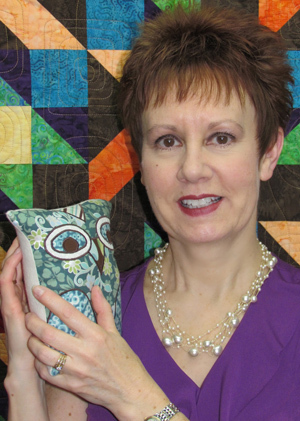 I’m flabbergasted to learn that I have been nominated for a SewCalGal Golden Quilter Award! In two categories! Seriously, somebody nominated me as best teacher/instructor and as best author. Oh how I thank you, whoever that was! While you’re at SewCalGal, you can vote for me if you think the instructions in my books are the best ever :) (and you can vote for all the other nominees). Click on Golden Quilter Awards. There are prize drawings for voting; the rules are at the bottom, before the comments. Off we go to Day 4 of Book-A-Round 2! It’s the third day of our virtual Book-A-Round. Today we zoom west and a little north to visit Louisville, Colorado, home of Erin Russek and her beautiful One Piece at a Time blog. I put in an extra place marker for Boulder, which is where I went to college way back in the day of bell-bottom hip-huggers :). Erin does the most gorgeous appliqué, and shares tons of tips and tricks on her blog. It’s almost like a photo tutorial every day! Go! Go now! While you’re there, be sure to visit Erin’s shop to see all of her scrumptious patterns. Today we’re headed to Oklahoma City to visit Darcy Ashton, author of many classics such as Grandma’s Bunnies (which I heard she just brought back), Claire’s Cats, Darling Little Dogs, and a bunch more charming appliqué titles. Today Darcy is hosting a guest post from me, where I get to talk about my journey to this second book from That Patchwork Place. Off we go to the Ashton Publications blog to read more about how Inspired by Tradition came about! I gab with Pat Sloan tomorrow! The wonderful Pat Sloan has invited me to be a guest on her internet radio show tomorrow afternoon! I met Pat a couple years ago. Here’s a link to the story of how we met, in a post called A funny thing happened in Long Beach. If you’d like to hear my dulcet tones (that’s a joke) then click over to Pat Sloan’s Creative Talk Network at 4:00 p.m. Eastern time to listen to the live broadcast. The first guest is designer Vanessa Christenson of V and Co. My segment will start at approximately 4:30 p.m. That’s Eastern time, so remember to adjust for your time zone. And just as a reminder, the very next day, March 22, we embark on a 10-day journey through cyberspace on the virtual Book-A-Round 2! Come on along… there will be more chances to win a copy of Inspired by Tradition. Start here each day to be whisked away to that day’s stop on the tour! Well, she had a nice spirit about her and the way she said it was funny, so that actually made me laugh. We started chatting and I asked her why she felt that way about appliqué. She told me that she had taken a class and had hated the process and the result. During our conversation I told her that there’s not just one way to appliqué and she just hadn’t found the way that suited her best. She agreed with that philosophy, and promised to give it another go. I hope I helped this nice gal be more receptive to our polarizing pastime. What do you say to fellow quilters who have experienced frustration with appliqué? •10-day blog hop, Book-A-Round 2, March 22-31. This morning I got up and did the happy dance. For me this looks like jumping up and down while doing the twist. 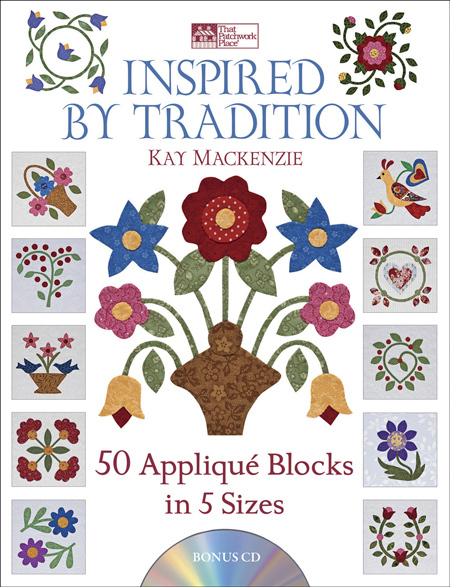 I am not normally much of a morning person, especially before coffee, but I was celebrating the fact that today is the official publication day for Inspired by Tradition: 50 Appliqué Blocks in 5 Sizes! 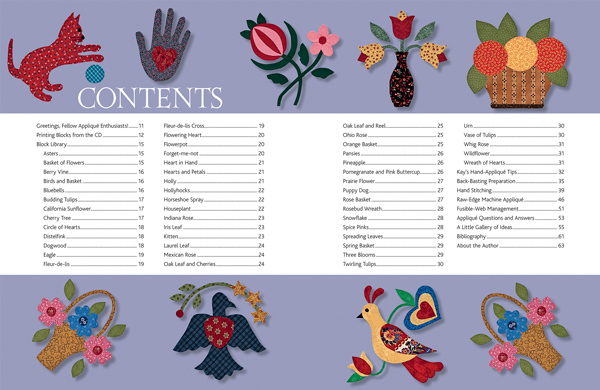 Here’s the Table of Contents, beautifully presented by That Patchwork Place‘s book designer. Here are a few more blocks. Some more very cool news: Pat Sloan has invited me to be a guest on her Creative Talk Radio show on March 21! That should be so fun, as Pat is a relaxed, outgoing person and totally easy to talk to. There will be giveaway goodness associated with this event, so be sure to mark your calendars. The next day, I’m kicking off Book-A-Round 2, a 10-day tour visiting other quilting bloggers. Each one will feature something a little different about Inspired by Tradition. More giveaway goodness, as a copy of the book will be offered in a drawing at each stop of the tour. Mark your calendars for March 22-31, and stay tuned for more information. I’ve got the new book up on my website now. Many of you have been following this story of another book for over a year now. In celebration of this long-awaited day, and to say thanks, I’d like to offer blog readers a coupon for $2.00 off orders from my website. Use coupon code BLOG2 during checkout. Coupon expires March 31, 2011. Flower Show Quilts by Lynn Ann Majidimehr. 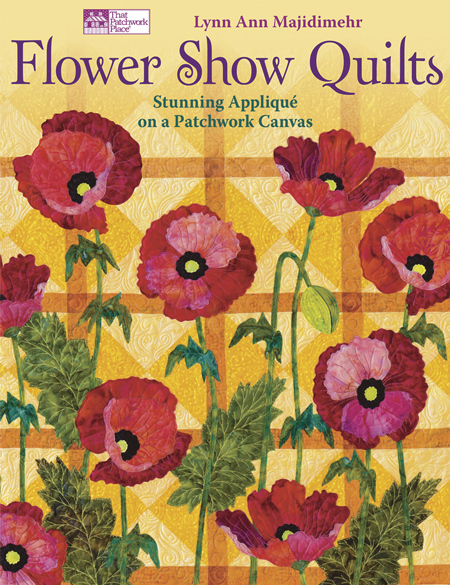 The subtitle of this book is “Stunning Appliqué on a Patchwork Canvas.” What a great idea! I always think that a combination of patchwork and appliqué makes the most appealing quilts. The front matter of Flower Show Quilts is a treasure trove of information. The author starts with quiltmaking basics, ranging from sewing supplies to presser feet to needles to fabric choice and preparation. Then, there’s a fantastic photo tutorial on a method of foundation piecing where you don’t sew through the foundation. No tearing paper away! Then we move to the appliqué information. Lynn takes us through two methods. First, there’s a tutorial on using fusible web that has no paper backing, such as Mistyfuse. This method always confounds me, so it was great to have it laid out before me step by step. Second, there’s freezer-paper, glue-basted appliqué. The freezer paper is ironed to the right side of the fabrics, and the edges are glued to the back. Quiltmaking basics continue with assembling the quilt top, borders with mitered corners, layering and basting, and a fantastic section on machine quilting. This is not your “quilt as desired” type of thing; Lynn includes tons of great information and photo examples of quilting by machine. There’s even specific, illustrated information on binding and adding a sleeve! Very comprehensive! Now we get to the beautiful floral appliqué designs, all on patchwork backgrounds. Here are just a couple of the 10 colorful projects included. 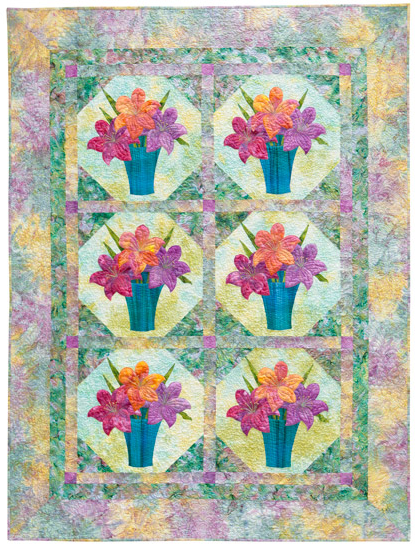 If you’d like to enter the drawing to win Flower Show Quilts, leave a comment on this post by 7:00 p.m. California time on Friday, March 4. U.S. and Canada only. Remember that if you are subscribed by email or feed reader, you’ll need to click over the the blog itself to leave a comment. Good luck!